It's been a nice week! Things have been rather slow at work, so I've been knocking stuff off my To Do list here at home. That's always a good thing! I have a couple of things to share today. First up is this card. 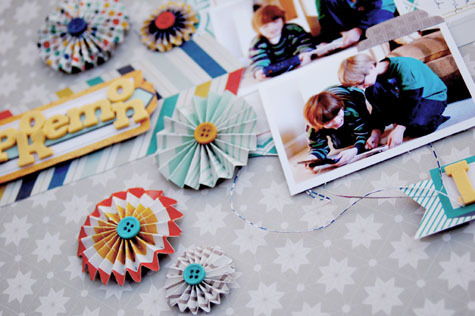 I made it for Stamp It 3 Ways, a new Paper Crafts special issue that just came out. I used a stamp by My Cute Stamps to build the background. Then, I added some Crate Portrait goodies. 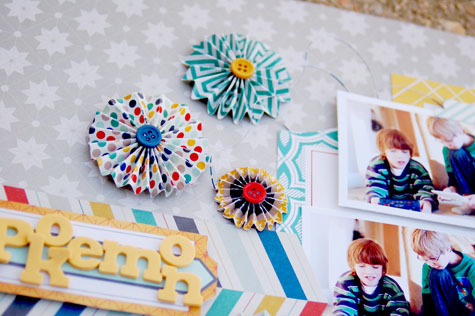 I love that chipboard flower, don't you? 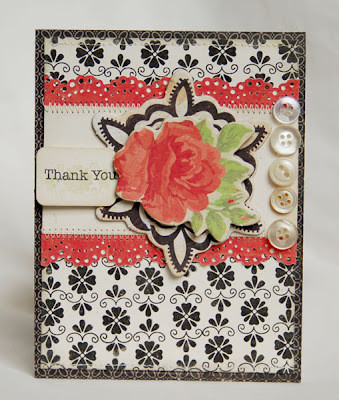 I used papers and embellishments from the Chap line, which I absolutely adore!! The colors are so perfect for my boy pages and the designs are so fun! I don't know if you can see, but I added some fun little paper 'shavings' to this. It happened quite accidentally. I was trimming the edges of the paper and they fell onto my page. Well, I loved how they looked when they were all curled up like that and I love how they matched the paper. So, I arranged them under the photos. They kind of remind me of thread or twine. 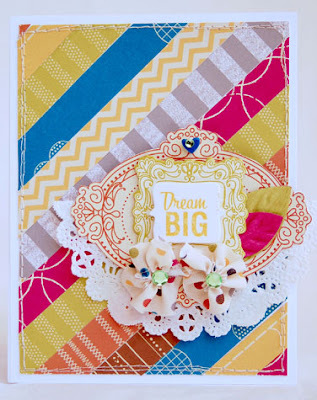 My final project for today is a card I made using the Amy Tangerine line. I adore the colors in this line sooooo much! 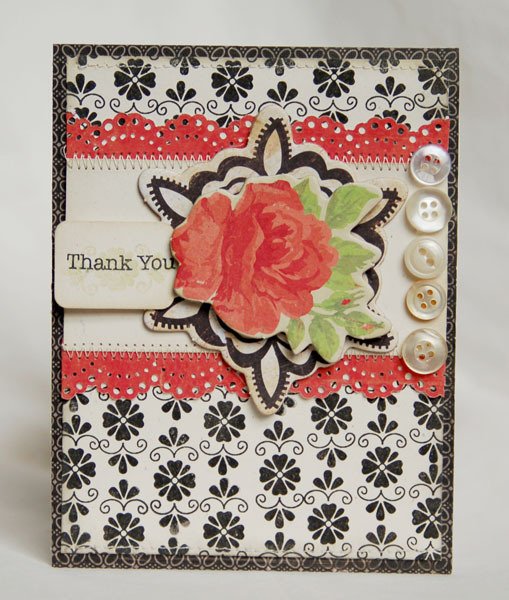 I decided to create the background by cutting a bunch of strips and laying them on the card, diagonally. Then, I added half of a doily, a cut paper frame and flowers made from fabric paper strips. Love these cards and layout especially the first one. The fabric flowers you made are so cute! 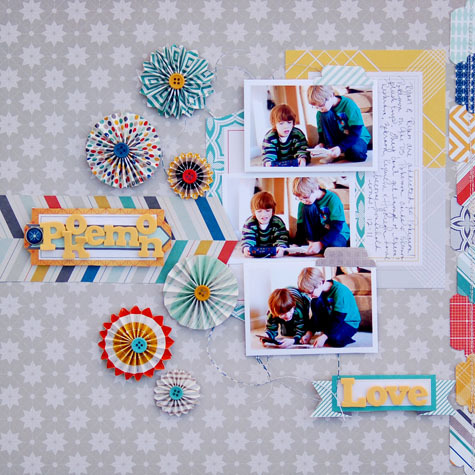 Gosh, your projects are just gorgeous! I really love how you used the buttons on the first card. And the second card is so bright and fun! Plus your layout looks simply awesome: you do such gorgeous boy pages! Loooove all of these! The first card is my fave, though - it's just SOOOO jawdroppingly stunning! 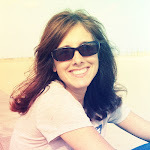 Your blog is full of tresors and I really enjoyed my little walk! You're so talented, I loved everything! !